Indian weddings are both religious and cultural. Rich in color, traditions, candid moments, and full of life. 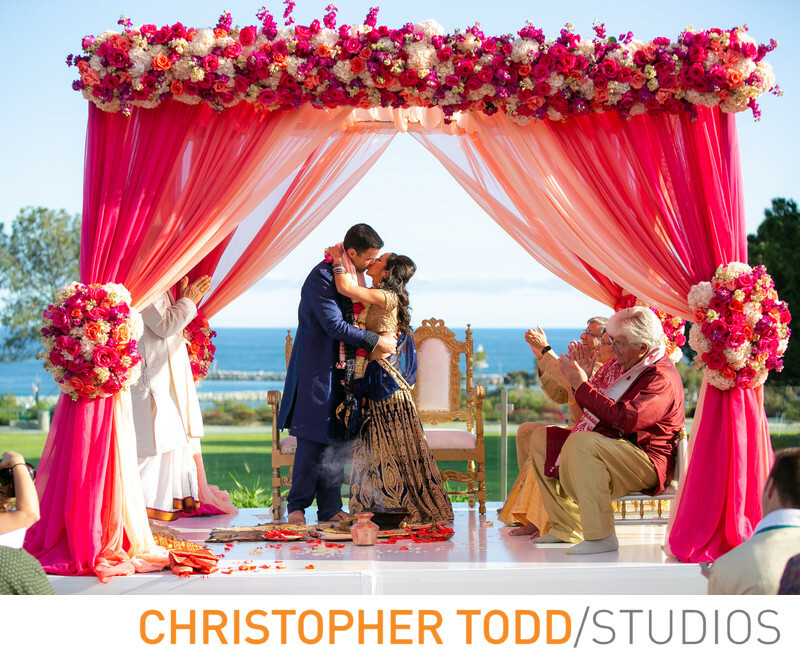 Exciting, loud, vibrant, and emotional can be used to describe the vibe of a traditional Hindu or Sikh ceremony. What Should Wedding Guests Wear? The brighter the better. Don't be afraid to wear a traditional sari or a colorful dress. Guys can also wear bright colors. What Is An Appropriate Wedding Gift? Like a western wedding, a gift from the couple's registry is appropriate. Having it shipped to their house is a great option. It is also common to bring an envelope with money to the wedding. A traditional Hindu ceremony can last up to an hour. Sometimes longer. There are many religious and cultural ceremonies that take place. Mendi This is the henna party which takes place days before the wedding. It is for women only like a bachelorette party. The darker the henna the stronger the marriage. Haldi A yellow turmeric paste, which elders put on the forehead of bride and groom for good luck. Baarat The groom arrives on a white horse followed by the processional with his wedding guests. There is usually a DJ leading with his portable sound system. Along with a dhol drummer. The excitement comes from the modern fusion beats that accompany the drum beats. All the while the bride is secretly watching from afar. Kanya Aagaman The Arrival of the bride to the Mandap. What Do The Bride And Groom Wear? During the ceremony, the bride wears a traditional sari. Usually red or a vibrant color. The groom will wear a Sherwani. An elaborate suit. You can also expect the couple to change into a formal outfit for the reception this is usually more western attire. Tuxedo and a white gown or colored dress. Will There Be Dancing At The Reception? Not only will there be dancing but also a few performances. Couples often hire performers for a choreographed dance. Many family and friends will also perform at the reception. Location: 25135 Park Lantern, Dana Point, CA 92629. 1/500; f/3.2; ISO 100; 70.0 mm.